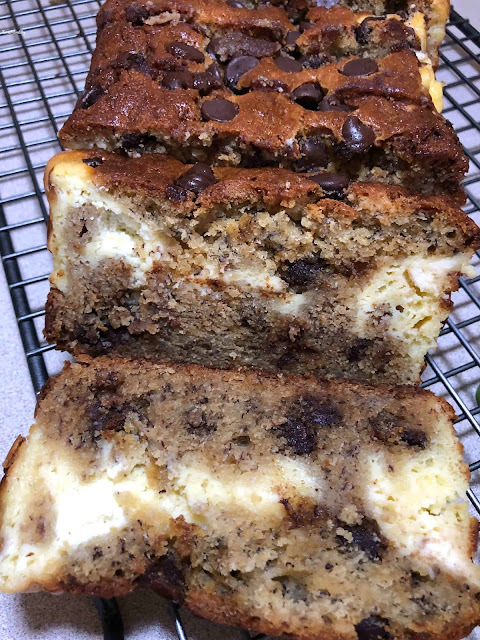 When I made these Banana Cream Cheese Chocolate Chip Muffins, I decided to use the same recipe and tweak it a bit to make Banana Cream Cheese Chocolate Chip Bread! It is just absolutely yummy! The banana bread was moist and delish, and that cream cheese center is such a treat! Combine egg, sugars, butter, and vanilla in a bowl. Stir in flour, baking powder, and baking soda. In a separate bowl, mix together egg, cream cheese, sugar, and flour. In a prepared 9x5 loaf pan, pour half of batter, spread cream cheese filling onto batter, and top with remaining bread batter.